How about taking your family on an adventure this year? The Pocono Mountains are a great vacation destination. Between stunning scenery and rich history, it’s a match made in heaven for explorers at heart. Discover all the marvelous things you can do while you’re here, especially kid-friendly activities at Lake Wallenpaupack to keep your little ones entertained! 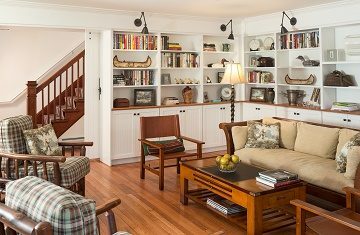 Read on to discover some of our favorites and get ready for an exciting vacation. 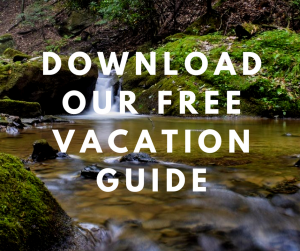 Learn more about the area in our free Vacation Guide! Between top-notch local restaurants, events, shops, museums, and outdoor adventures, you’ll be an expert in no time! There’s nothing like spending the day out on the water, especially when surrounded by gorgeous landscapes at Lake Wallenpaupack. Take advantage of our recreation center and rent a kayak or a paddleboard! Not only is it a great bonding experience with your little ones, but also a fun way to show them the beauty of Pennsylvania. Reconnect with yourself, spend quality time with the ones you love, and learn a new way to enjoy the water! Are you an angler who wants to pass on this passion to your kids? We recommend renting a boat and going on a fishing adventure! At Silver Birches, we offer pontoon boats, ski boats, and fishing boats for use. The entire family will have a blast catching a variety of fish in Lake Wallenpaupack. The species include striped bass and walleye for example. Here’s a map of the lake to help you plan your day on the water. Fishing Licenses are required for adults, and the visitor center has free fishing poles to lend out. Take a break from the water and change your perspective of the lake. Another great activity to enjoy with your kids is to bike around the Lake Wallenpaupack Trail. It offers gorgeous views of the area and makes for a lovely family stroll. The trail is 1.5-miles long, which makes it accessible for all generations and levels. Soak up the scenery as you bike along the water, downhill toward the Wallenpaupack Creek, and through the chestnut oaks forest! After enjoying all these fun activities, you can reward your little ones with a well-deserved break at Cocoon Coffee House! They’ll probably be hungry and tired, and all they need is a cup of hot cocoa and a delicious, homemade pastry. 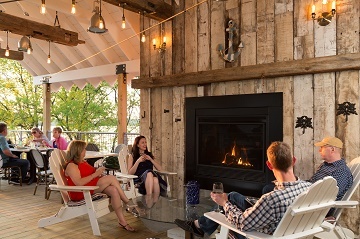 It’s the perfect place to recharge and laugh about all the wonderful memories you’ve made during the day. 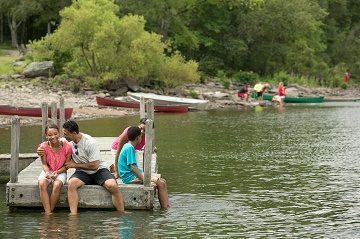 Witness the biggest smile on your children’s faces after having fun at Lake Wallenpaupack! Then, you can all come back to Silver Birches where a relaxing room awaits! Our beautiful accommodations are the perfect place for you and your family! Take a look at our cottages, for example! You can enjoy a spacious vacation with a stunning view of the lake. Lounge on our luxurious queen bed and wake up the next morning feeling as refreshed as ever. Open your eyes to the sound of birds chirping and make yourself a hot cup of coffee in your fully equipped kitchen. 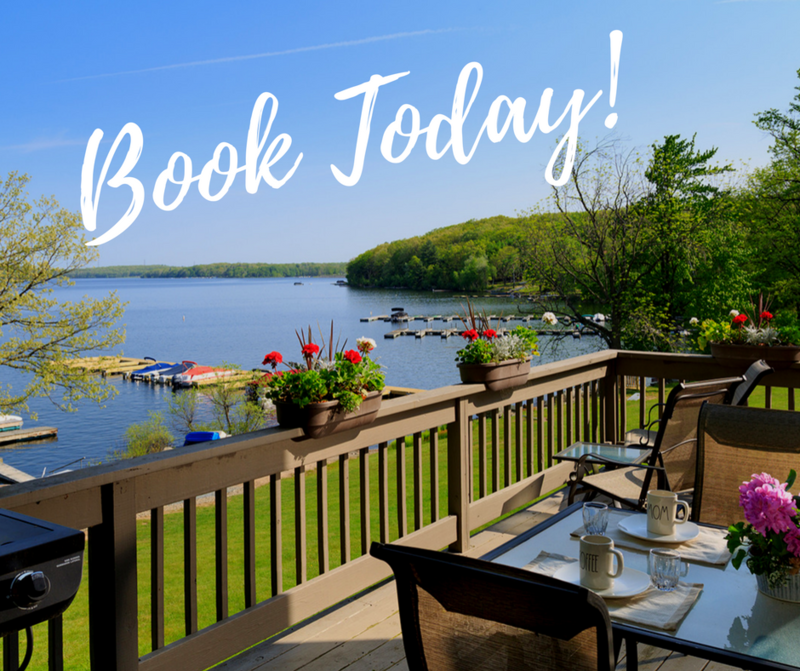 The next morning, find yourself a good Adirondack chair overlooking the lake and enjoy a delicious breakfast at The Dock on Wallenpaupack!